Besides what some may think, male actors in Hollywood are also not immune to the insecurities when it comes to their appearances. While plastic surgeries are definitely not as popular among men as they are among women, a lot of actors resort to the cosmetic procedures and surgeries to keep their youthful appearances. Here, I will look at Brad Pitt to see whether he had any works done on his handsome face. William Bradley “Brad” Pitt, born on the 18th of December, 1963, in Shawnee, Oklahoma, is one of the most famous Hollywood actors in the world. The actor has a long and successful career and some of the most prominent movies starring Brad include Fight Club, Moneyball, Inglourious Basterds, The Curious Case of Benjamin Button, and many others. Ear pinning surgery is not at all uncommon among models and actors as it is low-risk and not very complicated. At the same time, when done successfully, it can dramatically change the way a person looks. 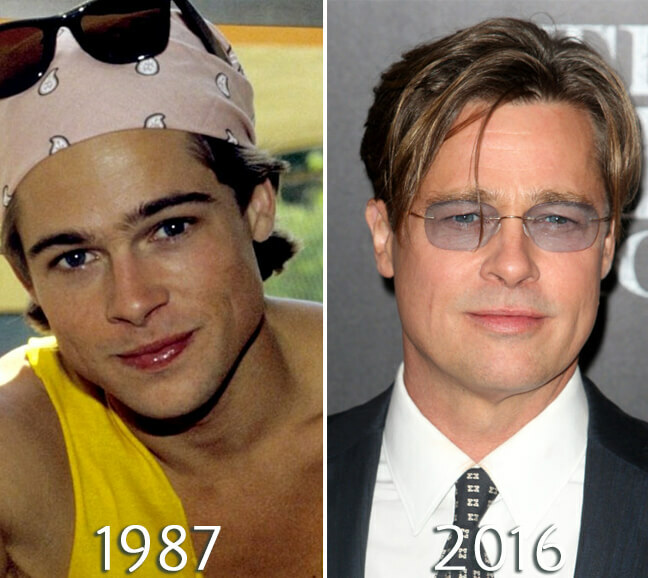 By looking at the photos of Brad Pitt at the beginning of his career when he was young and now, I can make an assumption that Brad has possibly undergone a surgery to make his ears protrude less. Blepharoplasty is a highly popular surgery that allows people to look a lot fresher and more awake. The results are achieved by smoothing out the skin around the eyes and getting rid of the under eye bags that become especially common with age. 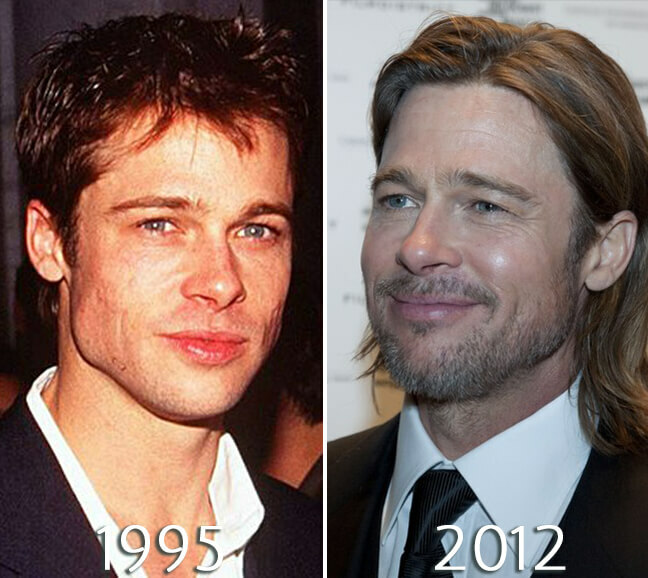 It seems that Brad Pitt had this procedure done for the first time in 2008, as I could notice that his under eye area started to look a lot less puffy and wrinkled. 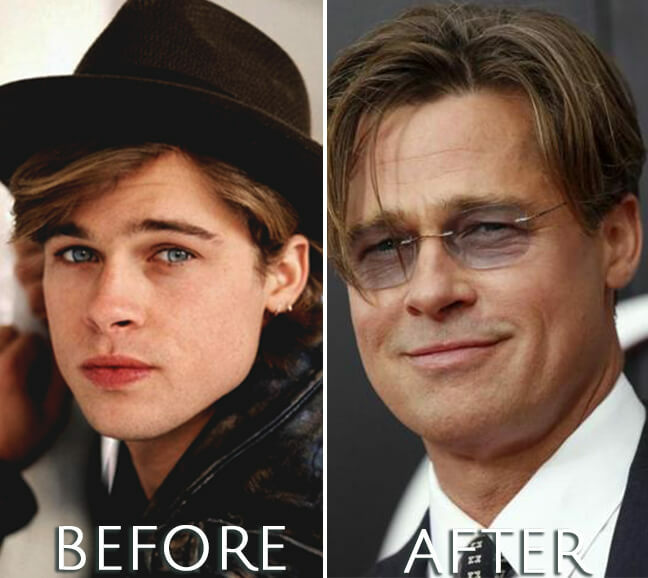 Around the time of the supposed blepharoplasty, people began to notice that the wrinkles, which were quite prominent on Brad’s face, especially on the forehead, seemed a lot less visible. 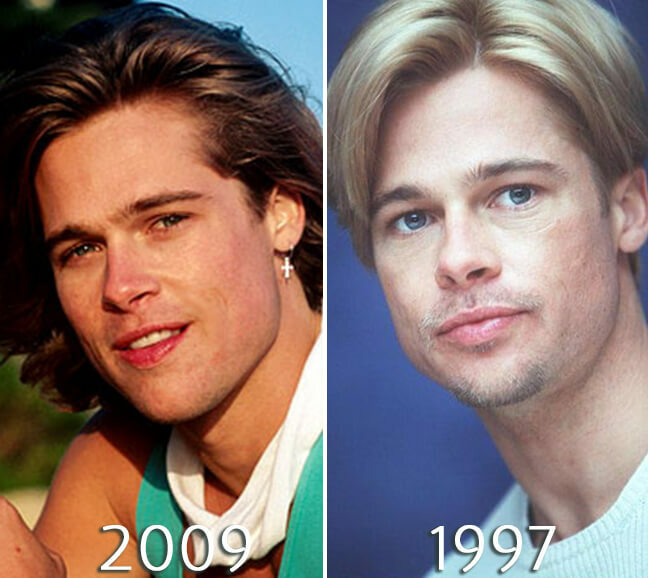 It’s unclear whether his smoother skin is a result of the Botox injections or other types of wrinkle fillers, but there is no doubt that after the possible procedures, Brad started to look younger and less tired. Being a famous person, Brad’s face is constantly looked at and analyzed by the general public. 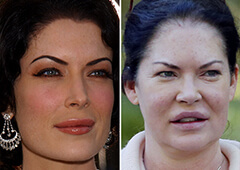 As a result, there have been numerous rumors circling the web concerning the actor’s possible facelift. 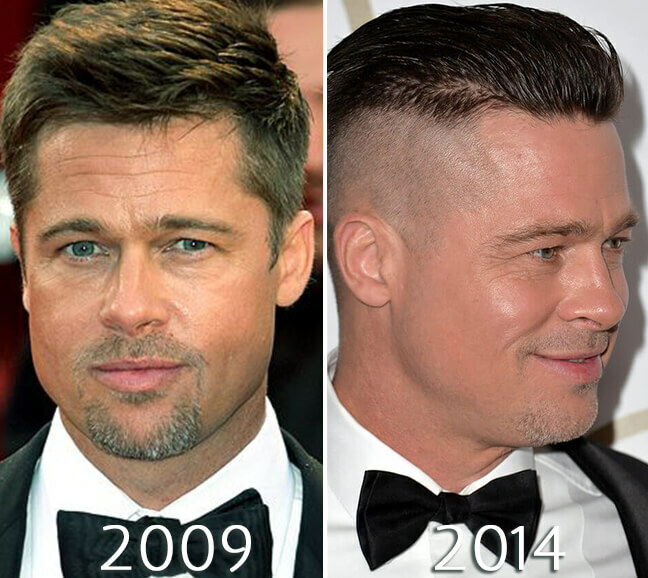 Comparing recent photos of Brad Pitt to his public appearances from several years ago, it seems that the actor may have resorted to a facelift surgery. The skin on his entire face looks quite smooth, and the nasolabial folds that were obvious before, do not look nearly as harsh. 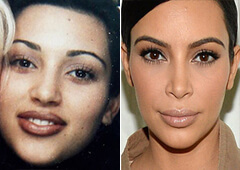 These days it’s virtually impossible to surprise people with plastic surgeries, and a lot of public figures realize that it’s nothing to be ashamed of and hide. 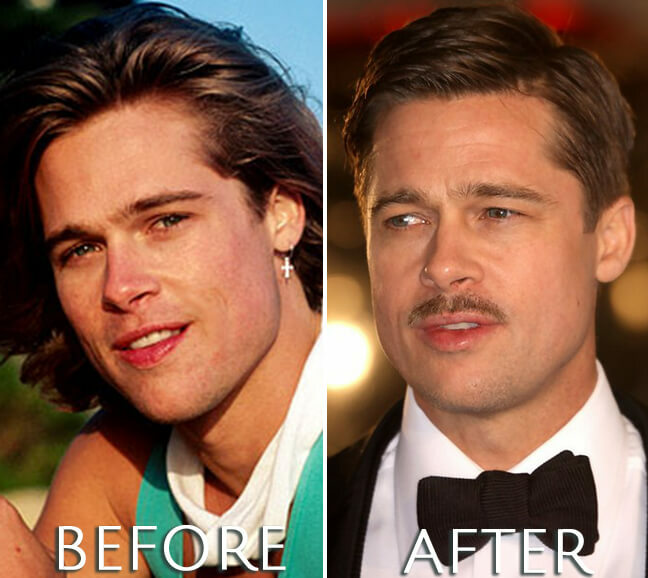 While a lot of actors and actresses freely admit that they have undergone plastic surgeries, Brad Pitt refuses to comment on any potential cosmetic procedures. But, it’s quite possible that the actor decided to reverse time and stop the process of aging by going to the professionals and getting Botox injections and face lift, as he seems to get younger and younger by day. In addition, he probably fixed his ears some time at the beginning of his career. At the moment, we can only guess what plastic surgery has been undergone by Brad Pitt to keep looking as amazing as he does in his fifties.